With the first flight of the Model 150 during September, 1957, the company re-entered the two-seat lightplane market. Production of the Model 150 began in August 1958, and by the time it ended during 1977 a total of 23,836 airplanes had been built. 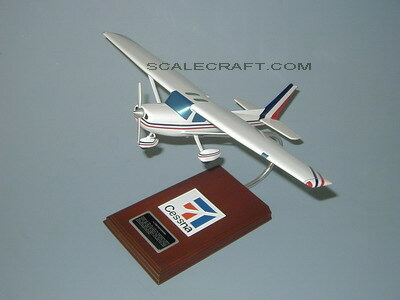 At that time it was replaced on the production lines by the basically similar Cessna Model 152. Improvements on this airplane included a more powerful engine plus installation and cowling changes to reduce engine noise and vibration, together with a McCauley propeller of a modified blade section. When production of the Model 152 ended in 1986, 7,482 Model 152s and Aerobats had been produced. The Model 152 was powered by one 108-hp Avco Lycoming O-235-N2C flat-four piston engine, giving the airplane a maximum speed at sea level of 125 mph, service ceiling of 14,700 feet, and a maximum range of 719 miles. Mahogany wood. Scale 1/24. Wingspan 16 3/4 inches, length 12 inches.